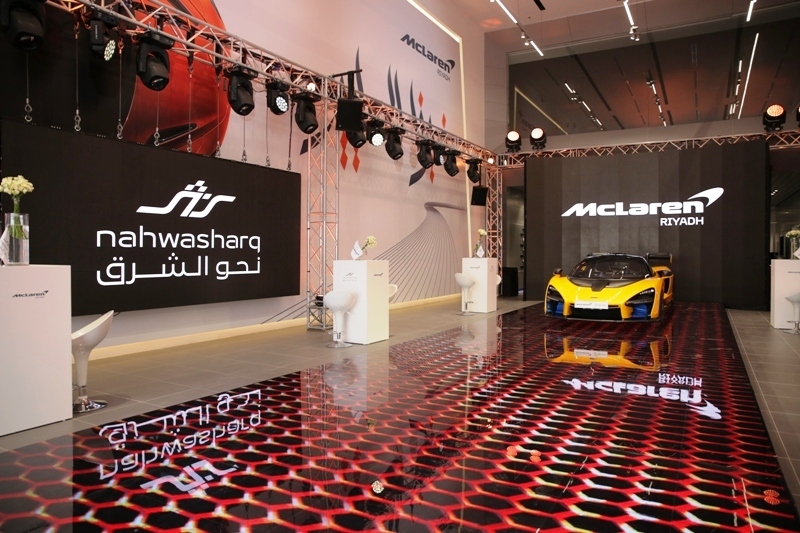 Following new openings in Dubai, Beirut and Bahrain, McLaren Automotive, the British creator of luxury, high-performance sportscars and supercars, continues to expand its presence in the Middle East as part of its Track25 business plan, with the inauguration of a new retail facility in the city of Riyadh in the Kingdom of Saudi Arabia. VIPs, officials and supercar enthusiasts from Riyadh and surrounding areas attended the official opening at Imall, Al Nakheel District. The brand-new sales facility offers over 600sqm of space to display seven cars in McLaren’s growing high-performance vehicle range, which encompasses the Sports, Super and Ultimate Series. The dedicated McLaren showroom’s modern design features the brand’s latest visual identity and allows customers and fans to fully immerse themselves in the world of McLaren. A unique, custom-made graphic featuring Arabic calligraphy dominates the walls from the ground floor up to the mezzanine office level. Visitors can enjoy a coffee bar and utilise the high-tech configuration lounge which gives customers the ability to design interior and exterior aspects of their McLaren visually on a 65” touch point screen. The retail experience is complemented by the neighbouring aftersales facility, offering clients professional technical service and assistance through McLaren trained service personnel. Brett Soso, Managing Director of Middle East, Africa & Latin America for McLaren Automotive. The showroom opening ceremony featured the unveiling of the McLaren Senna, the company’s ultimate road-legal track car. It was named after the legendary McLaren Formula 1 driver, Ayrton Senna who won all three of his World Championships at the wheel of a McLaren.